Do you feel like the “little things” have taken over your life? without sacrificing any of the things you enjoy! If a typical day of yours was made into a movie, would it be called "LIFE ON THE TREADMILL?" Will the audience see you stressed from too much to do, too many demands, and too little reward for your efforts? Will they identify with you as you grow frustrated with your hectic pace — watching you move faster and faster - without ever getting caught up? Will they worry along with you as you search in vain for a more satisfying life — filled with happiness, balance, achievement, harmonious relationships, and self-fulfillment? And, as the movie ends and viewers leave the theater, will they be left with the lingering question, "I wonder if this person will ever find the answer?" Basically I'm a happy, well-balanced person. But lately, circumstances in my life began to take their toll on my health, my sanity, and my relationships — forcing me to reevaluate my goals, and even put some of my dreams on hold. Luckily, I was fortunate to find the answer to how I could not only handle it all — in a relaxed, stress-free manner — but move forward at an accelerated pace. I want to share it with you. I thought I had heard everything ... but recently, I had an experience that left me with many profound and lasting benefits. During the past few years I found myself getting into a mess. My life was speeding up and pressures were mounting. I began to feel stuck — at times a bit overwhelmed by the demands on me. I felt alone with my stress. I couldn't talk about it with others. Part of the problem was that I grew up in an era in which men weren't supposed to talk about problems because it was a sign of weakness. So, instead of appearing weak, I took on the role of "Superman" — and pushed myself harder — hoping to get a handle on it. At times, when I did confide in others, either they didn't understand the pressure I was under, or they weren't sympathetic. For instance, once, when I complained to a business colleague about my huge work load he tried to outdo me with ..."You think you've got a lot on your plate, wait 'til I tell you about my day," ... and then he rambled on about his job stress — as if we were playing a game in which the more you pile on your plate, the more important you are. I didn't want to play this game anymore. I needed a change. I began dreaming of a life which was totally different — one that would recharge me instead of drain me — in which I'd wake up each morning thankful to be alive, and eager to start my day. But events, which were outside my control, were creating too much pressure ... and I was watching a job that I used to love slowly turn into an uphill battle. Then I found the answer. Something came into my life that spun my thinking around 180 degrees and opened my eyes. If I hadn't seen the results myself, I wouldn't have believed that it was possible. Even though the world is still rushing at high speed, I am now relaxed, centered, and in control of my life. - I still work in a competitive business environment, face difficult situations, and have to make tough decisions. - I still commute to and from work each day in the same bumper-to-bumper traffic. - I still have business trips that take me out of town. - And I still have the same amount of work on my plate. And that is the subject of this email. I've learned that my happiness has absolutely nothing to do with my circumstances. I can now trigger happiness, serenity, and peace of mind from within — whenever I wish. In situations that would drive most people crazy, I stay levelheaded, function clearly, am more focused, and work efficiently. You will sail through your day relaxed — like the calm eye at the center of the hurricane. While people around you lose their heads, you'll remain perfectly balanced, clear-headed, and in full control. While people around you make stupid mistakes because of the stress they are under, you'll see brilliant solutions and face each situation with grace, inner peace, and wisdom. While people around your burn out, tune out, and check out ... you'll become more involved, and be an inspiration to others. Even if everything in your life remains the same — the people, places, events, your job — one thing will be different ... You! And when they ask you, "What's your secret?" You can answer, "It's simple ..." and tell them the information that I'm about to share with you. Let me make this clear. I didn't come up with this answer. The secret is timeless. Since the beginning of human civilization, the wisest people of each society and each generation have been seeking this answer. Few found it. Even fewer knew how to put the discovery into words so that others could benefit from it. Often shrouded in metaphor, it remained inaccessible to most people. Recently, one person, a gifted young man who lives in California, found the answer and is spreading the message. And what a remarkable person. People magazine named him one of the "25 Most Intriguing People of 1997." You may have seen him on television or heard him interviewed on radio — having appeared regularly on The Oprah Winfrey Show, The Today Show, CNN, and more than one thousand other programs. His books, which sell like wildfire, have been on the bestseller list of the New York Times, Los Angeles Times, USA Today, Boston Globe, Washington Post, San Francisco Chronicle, San Diego Tribune, Denver Post, and the Wall Street Journal. He is one of the rare authors to have two books on the bestseller lists at the same time. Who is he? And what's his message? I'll tell you in a moment. First, let me share my personal story. YES! I want to discover how to turn ordinary moments into extraordinary experiences, every day. I have lived my entire life here in the Chicago area. I'm married to a loving wife and we have two wonderful kids. Back in the '80s, I took over the reins of Nightingale-Conant — a family business that my father, Lloyd Conant, and his friend Earl Nightingale, started over 50 years ago. We publish audio programs — recorded by many of America's most highly respected people in their fields. Stepping into the driver's seat was easy because I've been groomed for this job all my life. The first few years were great. My dad and Earl were supportive as I introduced my own ideas. Business grew and we hired more people, and launched many successful recordings. Then things changed for the worse. Earl, who had been struggling for more than 25 years with acromegaly, a painful chronic illness, suddenly died from complications after heart surgery. As if that weren't bad enough, my dad, who had been fighting cancer for several years, also passed away. To the outside world I had to appear strong and in control. But inside, I wasn't sure of what I wanted anymore. Suddenly, life seemed too short. Work became harder and harder. While the business kept growing, something was happening to me inside. I knew that I wasn't as happy as I used to be. Then, one evening, an event made me realize that if my life didn't improve, and soon, it may be too late. I was driving home from O'Hare Airport. I had just flown back from New York and I hadn't seen my family in three days, but it felt more like three weeks. I was exhausted. Traffic was at a standstill. As I sat in my car, waiting for the traffic to move, my mind started to think of the mountain of work ahead of me, the calls to make the next morning, the meetings to attend, and the decisions to be made by the end of the week. I could feel the tension build inside me. My fingers tightened around the steering wheel. "What the h--- am I doing?" I said to myself. "Why am I busting my tail? Is this what life's all about? I've got to find ... " Then suddenly, without warning, bang! The driver behind me bumped me. Nothing serious. But enough to jolt me back to reality. I stepped out of my car, and the driver who hit me, a well-dressed man in his early 40s, approached me with an angry look. "What the #*@% do you think you're doing?" he shouted. "Are you deaf? I've been sitting on my horn and you didn't move!" "Did you ram me on purpose?" I asked in disbelief. "That's just for starters, pal!" he snapped back. I looked at our bumpers and couldn't see any damage. I was tired and the last thing I could handle was a fight. "Look," I said, "I'm sorry. I've got an awful lot on my mind and didn't hear you beep your horn." His expression suddenly changed. His face relaxed — drained of the rage that he had exhibited a few seconds ago. "I'm sorry," he mumbled. "I guess I just lost it. I've never done this before. I've had a really bad day and I'm running late. I'm really sorry," he said. "My day hasn't been that great either. Let's forget it." We shook hands, apologized a couple more times, got back into our cars and drove off. I felt like a jerk. I'm sure he did too. I couldn't continue like this. I had to make a change in my life and I had only one option open to me. I had to ... quit! My only hope of living a stress-free life, and restoring all that was of value to me, was to quit what I was doing. I had no choice. I had to sell the company. Why keep knocking my head against the wall? Quitting would solve all my problems. It seemed so simple. That night, when I mentioned my plan to my wife, she could see I was serious. "Vic," she said, "it's your decision and I'll go along with whatever you decide. But think it through carefully. You do love the business." "I did," I said, "but lately, I'm not so sure anymore. It's getting tougher to run a business. Things are moving too fast. And I'm not sure I've got what it takes." We didn't talk about it anymore that night. But my mind was racing, full of conflicting thoughts. A business colleague came to mind. He retired in his late 40s and spent his days doing everything he had always wanted to do but never had the time for. I envied him. While I was working hard, he was traveling around the world. While I was glued to my desk, he was out on the golf course. And while I was stuck in traffic, he was sailing around the Florida Keys. I would trade places with him in a heartbeat. But, to my surprise, he quickly tired of his "dream life." After two years, he was bored silly. His new life was now as empty as his stressful life had once been. He had it all, but he was dissatisfied. Even though he had all the money and time in the world ... he had less energy, less purpose, less enjoyment, and surprisingly ... instead of having more life, he had less life. Are we supposed to work until we drop? Or do we check out of the rat race and die of boredom? Isn't there a happy medium? There is. And I'm one of the lucky ones who has found it. Let me explain. The more I thought of selling the company, the guiltier I felt. My dad had put his heart and soul into building this company and so have I. Each month I get hundreds of letters from enthusiastic customers who thank me for our products and the positive changes we make in their lives. When I considered everything, I knew I could never sell the business. But I was in a jam ... and I didn't know what to do. "Richard who?" was my reaction when Gary, our marketing manager, mentioned his name. One afternoon, Gary and I met to discuss an idea of his. "Vic, there's a phenomenon happening out there that you should be aware of. An author, by the name of Richard Carlson, has come up with quite a breakthrough and his book is one of the hottest things to hit the New York Times bestseller list. I'd like to get him into our studio to record an audio program." "Don't Sweat the Small Stuff." "I've heard of it. How many has he sold?" I asked. "Seven million? That's impossible! Who is this guy?" "He's a stress-management consultant and he's developed a simple method to deal with stress. He's been showing everyone — from CEOs and top executives of large corporations, to 'Supermoms' who juggle jobs and families — how to handle life with ease. They're learning how to get everything they want, but instead of fighting the pressure, they're doing it stress-free." Gary went on to tell me that people who are using Carlson's method quickly feel back in control of their lives. They become balanced, improve their relationships, become free of money worries, and are finding inner peace. These people love their jobs again. They feel rejuvenated, more focused, think more clearly, make better decisions, get more done, and have more free time. He's even showing parents how to get along better with their kids. "I guess you want to produce an audio version of Don't Sweat the Small Stuff," I said. "No. I've got a better idea. Carlson's written 13 books, including Don't Sweat the Small Stuff at Work, Don't Sweat the Small Stuff with Your Family, You Can Be Happy No Matter What, You Can Feel Good Again, Handbook for the Soul, and Slowing Down to the Speed of Life. "I'd like to ask him if he's interested in recording a special program for us — one that covers all the bases — in which he talks about work, family, money, relationships, happiness — all of it — on one program." I liked Gary's idea, but since I wasn't familiar with Carlson's work, I felt uncomfortable giving him a go-ahead. I told Gary that I'd read his proposal and give him my answer in a couple days. I was certain that Carlson's advice was going to be along the lines of better time management and delegating the small stuff to others. But I discovered that it has nothing to do with that. Here's what I learned. "Let go of the idea that gentle, relaxed people can't be superachievers." "One of the major reasons so many of us remain hurried, frightened, and competitive, and continue to live life as if it were one giant emergency, is our fear that if we were to become more relaxed, we would suddenly stop achieving our goals. We would become lazy and apathetic." "Fearful, frantic thinking takes an enormous amount of energy and drains the creativity and motivation from your life. When you are fearful or frantic, you literally immobilize yourself from your greatest potential, not to mention enjoyment. "But when you are calm and relaxed ... you are free of stress, in control, and can see clearly. You are less distracted by your wants, needs, desires, and concerns. It's thus easier to concentrate, focus, and achieve your goals." I stopped and thought about what I had just read. An image came to mind that showed me that maybe it's true that the more relaxed you are in your endeavors, the more successful you'll be. I pictured a surfer, standing completely still on his surfboard, as he rode a huge wave. Even as the wave wrapped itself around him, he remained relaxed and almost motionless — letting himself be carried along by the force of the wave. If the surfer tensed up, he'd fall. The more relaxed he remained — in control, focused, centered and unfazed by the circumstances — the more successful he'd be. The same is true with everything you do. Whether you're involved in serious work or family issues ... or minor everyday things such as driving your car, eating your lunch, or talking to someone — the more relaxed you are, the more you are "in the moment," the better you'll be at it. Stay stress-free, and you'll not only perform better, you'll energize yourself, be happier, and find life more satisfying. But it seems like an impossible feat. How can we remain relaxed and stress-free when facing pressure, unrealistic demands, negative people, impossible deadlines, and crazy schedules? It can't be done. And it's easy! It may appear as a trick, but it's not. The method is a modern version of something that is as old as time itself. Monks have used the technique for thousands of years to reach higher levels of consciousness. In these higher states, they tap into superior wisdom and surprising degrees of clarity. Throughout history, famous men and women, whom we now call great visionaries, have tapped into this higher level of consciousness which gave them flashes of great inspiration. Imagine what you could accomplish if you had the ability to turn this power on — at will — whenever you wished. It's now possible. Believe me. This is not pie-in-the-sky stuff. It's real ... and it's the only way that you can find happiness in today's fast-paced, demanding world. Let me show you what I mean. Picture yourself at work — relaxed and in control — centered and operating from a superior level of consciousness. You've tapped into a higher energy field. Can you imagine how your day would be? People could say, or do, negative things to you and it would roll off you like water off a duck's back. The unexpected suddenly foils your plans. No problem, a new, and what is seen as a "brilliant solution," appears in your mind. Nothing, and no one, will throw you off balance. With each decision you have to make, you can now see more clearly than you ever imagined possible. Instead of getting muddled, and forcing yourself to make a tough decision, the obvious decision would appear with ease, and with 100% certainty. Decisions would be "no-brainers" — as easy as breathing. Let me explain how that one works. One of the things that's stressful, according to Carlson, is that when people look for answers to difficult questions, they push themselves to go after the answers and find them — as if they're digging a hole and looking for buried treasure. Exhausting. But with his method, the reverse happens: the answer finds you. Carlson shows people how to set up the problem in their mind and turn it into a homing beacon. Then, leave it alone and the answers that people are looking for come to them. Try it yourself and when people ask you, "How did you ever come up with such a brilliant idea," you can say, "It just popped into my head." You'll go through your day without doubt. You'll experience total certainty — operating from a deeper "Knowing." You will be worry free — no longer questioning and doubting yourself. Like a great athlete who makes amazing feats look natural and easy, you'll make your life look easy. Eager to learn Carlson's method for reaching this relaxed and highly effective state, I kept reading Gary's report and suddenly found myself chuckling. My wife looked up and asked, "What's so funny?" "I'm reading this, and for a moment I had the crazy idea that this guy is telling people to stop thinking." As I continued reading, my expression suddenly changed. I wasn't laughing anymore. That's exactly what Richard Carlson is telling us to do — to stop thinking. "Have you ever noticed how uptight you feel when you're caught up in your thinking? And, to top it off, the more absorbed you get in the details of whatever is upsetting you, the worse you feel. Thinking has a snowball effect — one thought leads to another, and yet another, until at some point, you become incredibly agitated." According to Carlson, too much thinking gets us into trouble. Our thoughts are not reality. It's our moods that create our reality. "If you're in a lousy mood, everything looks lousy. If you're in a good mood, and look at the same thing, you see it as good. By learning the secret of how to get into a good mood, your life will transform. "This is not about positive thinking ... because you're still replacing thoughts with other thoughts. Thinking robs you of energy." But there's another kind of thinking that puts you into the peak state." "At most times, your mind thinks like a computer ... lost in thoughts ... cutting you off from the energy around you. These thoughts take you away from the moment ... draining you of energy. "But there's another way of thinking that puts you into the peak state ... or 'The Zone,' as athletes call it ... in which you tap into more energy and greater wisdom. It's the Free Flowing mode of thinking. "When you enter the Free Flowing mode, you're suddenly in the moment — moving along with life — not against it. As you enter this state, time stands still, and you are focused — a wonderful nowness. You experience awe and appreciation. You exist in harmony with others. And feel energized, exhilarated, and more alive that you ever dreamed possible. "Learn how to tap into the Free Flowing mode and you'll possess the power to create MIRACLES EVERYDAY... able to turn ordinary moments into extraordinary experiences." As I finished Gary's report, I understood why millions of people praise Richard Carlson so highly. His unique insight, and deeper understanding of the true nature of life, is helping people to live life to its fullest. As you've guessed by now, I loved the project, and so did Richard Carlson when he was approached with the idea. Work began immediately and everything went smoothly — exactly the way that Richard says things should go. Everyone on the project who came in contact with Richard felt his magic, and learned many valuable lessons. "There was an amazing calm in the recording studio," said one of the sound engineers. "Richard is a guy who really walks the talk! Just being around him was magical." That same magic is in his program — which is aptly called Creating Miracles Everyday: Turning Ordinary Moments into Extraordinary Experiences. To help you implement miracles into your everyday life, we've decided to include Richard's "How to Create Miracles Everyday" workbook. Don't be misled by the title. There's no work involved. It's more like a guide- book — adding to the wealth that you'll hear on the recorded program. Incorporated into the workbook is something that we normally don't do. Here, you'll find a complete transcript of Richard's program. It's a great place to highlight messages of personal meaning, make marginal notes, or for easy reference later. This transcript even allows you to follow along as you hear him speak. This adds to your absorption of the wisdom. Plus, you'll also receive a set of daily reminder cards – small enough to carry with you and pull out any time you need to connect with the serenity and strength within you. These cards are your FREE GIFT to keep, even if you decide to return the program! Opportunities for true insight, real wisdom, and genuine life change are rare indeed. You are looking at one such opportunity right now, and I urge you, as strongly as I possibly can, not to let it go! Order Creating Miracles Everyday now, and find out how much happier, easier, and more abundant your life is when you operate from a level of zero stress. "I'm a successful professional; but at a price. Some days there's so much happening in my life that I don't know if I'm coming or going. I work too many hours, have too much on my plate, and I'm not sure if my kids know who I am. "Over the years, I've tried lots of different things in the hope that it would reduce my stress, make my life more manageable, satisfy my ambitions, and give me a greater sense of balance and control. Until Richard Carlson came along, I wasn't getting any closer to achieving these goals. "Carlson has shown me a simple way to maintain my hectic schedule and stay on track with my goals, but accomplish all of it with an ease — and a sense of serenity (there's no other word for it) — that blows me away. I feel like the calm eye at the center of the hurricane. It's amazing! Thank you Dr. Carlson." 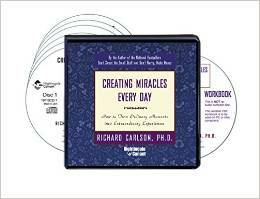 Please send me Dr. Richard Carlson's remarkable audio program Creating Miracles Everyday: Turning Ordinary Moments into Extraordinary Experiences for just $49.95 - an incredible 79% OFF the regular retail price! Take advantage of this limited-time special discount now! If this program doesn't get me to achieving my goals closer, I can simply return the program in the next 30 days for a full refund. No questions asked.